We recently completed a 6 week cold email campaign with Ambition. Because Ambition is a sales gamification software startup, their ideal buyer personas were“VP/Director of Sales” and “VP/Director of Sales Operations.” After creating 8 emails for each of the 2 types of prospects, our cold email campaign generated 73 leads from the 578 leads Ambition had collected. Persistence when following up–If we had stopped after the first email, Ambition would have only 6 new leads instead of 73. From the 73 positive responses, 24 happened at emails 6 through 8. The importance of testing different value propositions/messages — 32% of positive responders didn’t respond until after email 5. Why? Probably because they didn’t connect with earlier value propositions or calls to action. Through AB testing different messaging, we were able to identify the value props that resonate the most with prospects and drive responses. Our experience with our campaign for Ambition’s inspired us to create a foolproof guide to help you architect and execute effective cold emails campaigns like a pro. 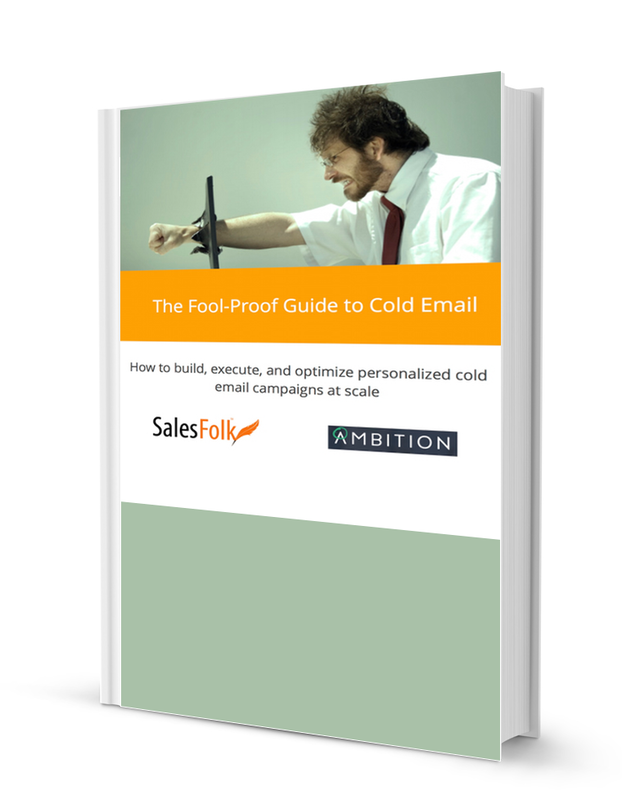 If you want to increase your response rates from qualified leads in your cold email campaigns, you should check out the “Fool Proof Guide to Cold Email Campaigns” by Salesfolk and Ambition. …and a few other important lessons you need to know in order to be successful with cold email.